A poet, a songwriter, an editor of a literary magazine, and a playwright. R.B. 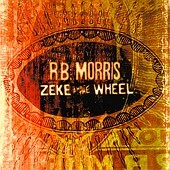 Morris emerges himself deep in the arts, as is evident on his sophomore release, R.B. Morris. A mixture of country, folk, poetry, pop, and even a bit rock 'n' roll, the album gently flows between different styles while always centering around Morris' voice and lyrics. The title track, which kicks the album off, is a honky-tonk rocker. Morris' dark, gusty voice casts a shadow over the music while you sit there emerged in not only his voice, but the rhythms of the music as well. "A Winter's Tale," on the other hand, is a folk-based tune that shows the softer, gentler side of his music. "I've Been Waiting" is a slow, deep pop song that calmly walks down a dark street at night contemplating life, love, and everything else going on inside his head. The lyrics are introspective; the song has a deep seeded feeling of being lost and trying to find yourself. "Call Me Zeke" picks the pace back up with a barroom rock-stomper. Then there is the album closer, "Lest We All Lose," a gentle, soulful country number that brings the album back home, summing up all the emotions found throughout the album in elegant, clean fashion. With gust, guts, and a bold voice, Morris moves through folk, country, and barroom rock, as well as some soul, in non-assuming fashion. Introspective, but still down to earth, the album has feeling; I'll give it an A-.